So bear in mind that he plans to go for it again next season. “I have never had so many good ones in one team …” Pros declares. The competition is warned. But now he is back with the pigeons and totally focused. Whoever thought that Pros was finished after his operation with the handicap of being in a wheelchair, would do better to revise that notion. Pros has never been more motivated, as he says himself. One thing is certain: Pros wants to keep holding his racers in his hands once every day. On days that he can’t make it to the lofts, the caretaker will have to put them in a basket and bring them to him. With that in mind, Pros wants to build a large balcony alongside his house. From there he can oversee the pigeons exercising, because here too nothing has changed. He still doesn’t want to miss a wing-beat. Pros Roosen is his glory days! Physically he now has problems … but mentally he is ready to over turn the field once more! 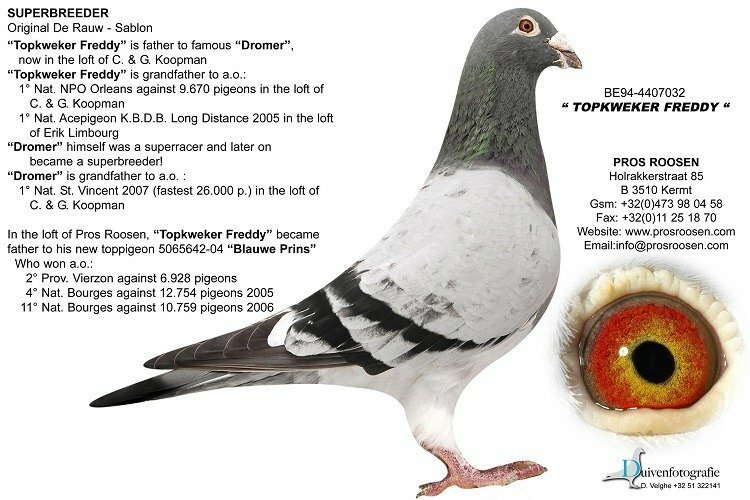 Pros Roosen is clearly determined to keep racing pigeons at a high level, purely on will-power and positive thinking. And he knows better than anyone else, that high-level pigeon racing these days is very different from that of 20 years ago. Everything in life changes very quickly, and the pigeon sport is no different. “Just have a look at the range of products in a specialist pet-shop. Years ago you saw grit, vitamineral, a few vitamins and in some stores a bottle of wheat germ oil. Now there are shelves full of by-products. Not that you need all those things, but there is certainly a market for them, and when you don’t give your pigeons something, you miss the boat. We ask Pros what ‘evolving’ means for himself. Does that also include searching for a different kind of pigeon? This ‘Computer II junior’, a son of the ‘Computer II’ x the ‘Meauxduivin’ – inbred to the ‘327’, forms the guide-line in the present plans of Pros. And Pros wants more, after all, standing still is going backwards. Other blood had to be brought in to fulfill his ambitions: to bring more stability in his team and especially, more long-distance qualities. He wants pigeons that are able to race in all types of weather and from all distances. 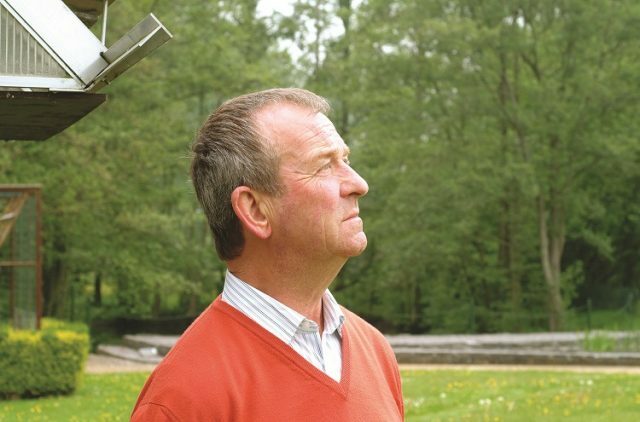 In the autumn of 2001, Romain Schots from Halen sold his surplus pigeons. Paul Huls bought the super breeder ‘De Rijck’ and Pros Roosen beat everyone to the ‘Antwerpenaar’ (6451510-92), then 9 years old. “The best purchase of my life,” Pros says without hesitation. And that says something for a man like Pros Roosen. Pros knew Schots as a modest fancier with only two dozen racers, but who could hold his own against the best on the provincial races. And Pros has a lot of respect for fanciers like that. 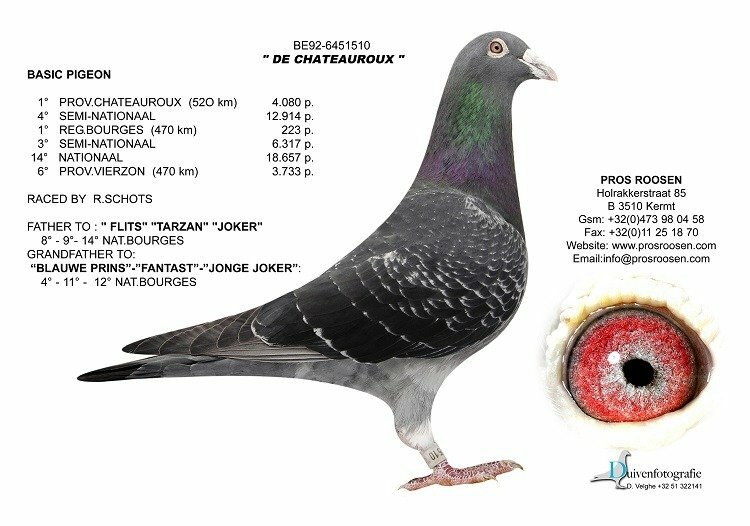 Pros didn’t like the name ‘Antwerpenaar’, and renamed this pigeon the ‘Chateauroux’. He added to the Roosen stock what the Soontjens pigeons lacked: stamina (resilience and endurance) to race from a distance, like for instance Limoges. – The ‘Super’ (5067101-96), good for 12/1,492 Bourges, 25/2,936 Bourges and 27/3850 Chateauroux. And these are just a few of his prizes. 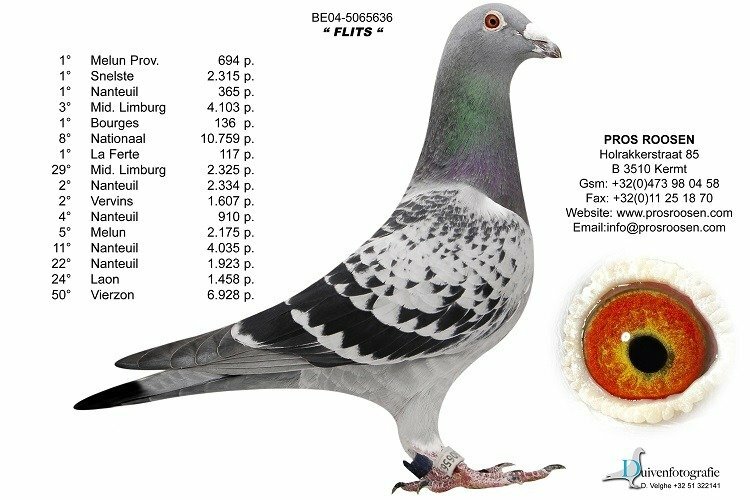 – The inbred ‘Antwerpenaar’ (5082412-95), who was even better with 2/4,080 Provincial Chateauroux (he came second behind his own father), 8th Semi-national against 12,914 pigeons, 8/1,628 Montargis, and several other top prizes against a smaller number of pigeons in races from Orleans, La Souterraine and Bourges. The ‘Inteelt Antwerpenaar’ was a good breeder too, like his father. Schots wasn’t a fancier who had an extensive administration and he almost never noted down the results of his pigeons. The pedigree of the ‘Antwerpenaar’ was not entirely documented, but that didn’t matter much for Pros. He liked the pigeon, it had proved its worth and had won a few impressive prizes. 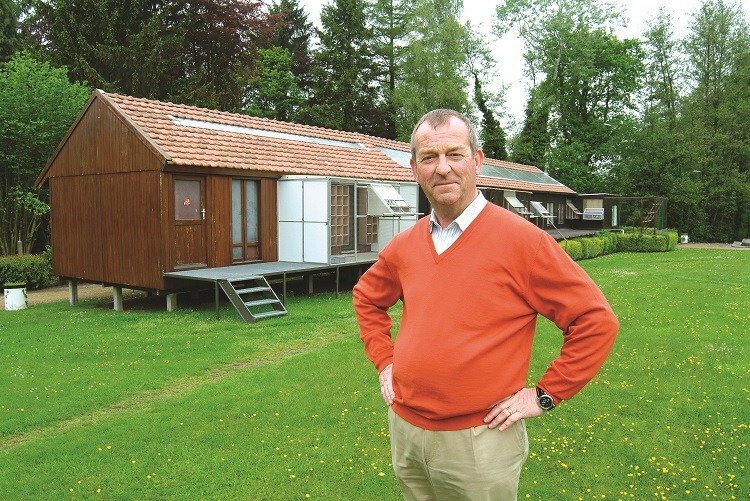 When Pros came home with his renamed ‘Antwerpenaar’, he didn’t hesitate and paired him with his three best Soontjens hens, a daughter and two granddaughters of his favorite new stock breeder, the ‘Computer II junior’, and with immediate success. The ‘Klein Aske’ produced first the ‘Joker’, and two years later the ‘Flits’. The ‘Flits’, is already almost as good as the ‘327’. He already has top results against thousands. With the ‘Nest sister’ of his ‘Bourgesman’ the ‘Chateauroux’ – a.k.a the ‘Antwerpenaar’ – produced the ‘Tarzan’, ring number 5115302-03. A pigeon that sometimes has trouble returning home, but who won two years in a row the 9th and the 14th National Bourges, with five pure first prizes, despite his lingering. A brother of the ‘Tarzan’ won 1st Provincial Melun and was the fastest against 3,400 pigeons. To recap: three children or grandchildren of the ‘Chateauroux’ have in a few years time won: 4th, 8th, 9th, 11th and 14th National Bourges against an average of 10,000 pigeons. The father of the ‘Blauwe Prins’ leads us nicely into the next chapter. We are talking about the world famous ‘Freddy’. At the end of 2003 the pigeon world was in upheaval. There was a total sale of the almost invincible tandem De Rauw-Sablon from Ophasselt and the quality of their pigeons caused a massive turnout. Who wouldn’t want them, pigeons that fly provincial victories without effort … and that are also good breeders. That the ‘Freddy’ hadn’t been worn out yet, has been amply proved. It is now several years later, and he still fertilizes 95 per cent of his eggs. Pros couldn’t ask for more. Meanwhile, the ‘Freddy’ is the most sought after and famous breeder of the present time. “I can sell every one of his descendants for a good price,” explains Pros, “but I didn’t buy him for that. I want to make my own position in the races stronger through him.” And Pros being Pros, throws the offspring from ‘Freddy’ in the deep end without pardon. Every time a small fortune rises in the air … but that is pigeon sport of the highest order. Why is the ‘Freddy’ suddenly so much in demand? – Out of a son of the ‘Dromer’, the Koopman’s bred ‘Miss Maniwan’ (NL 1936562-05). She won the 1st National NPO from Saint-Vincent against no less than 26,018 pigeons. 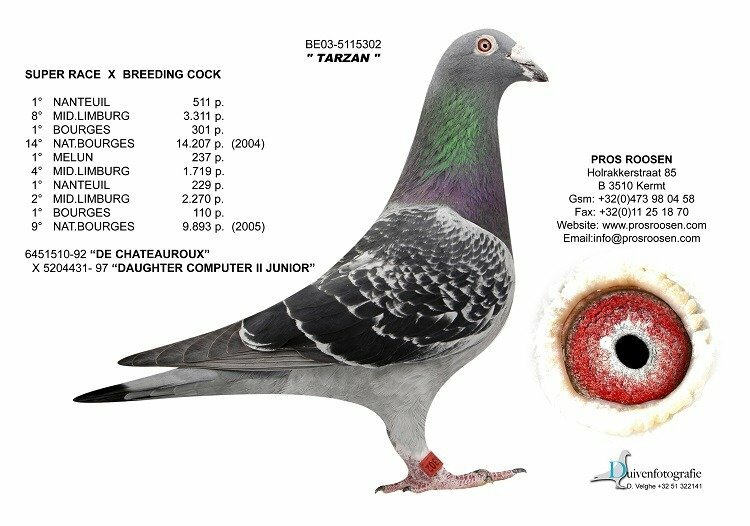 – And if that isn’t enough, the ‘Doran’ (5533117-05), a son of ‘Mister Expensive’, won the 1st National from Orleans against some 9,670 pigeons. And before that, the ‘Doran’ had already won 21st from Chantilly against 13,008 pigeons. The breeding qualities of the ‘Freddy’ were now amply justified. And his market value made a meteoric rise. 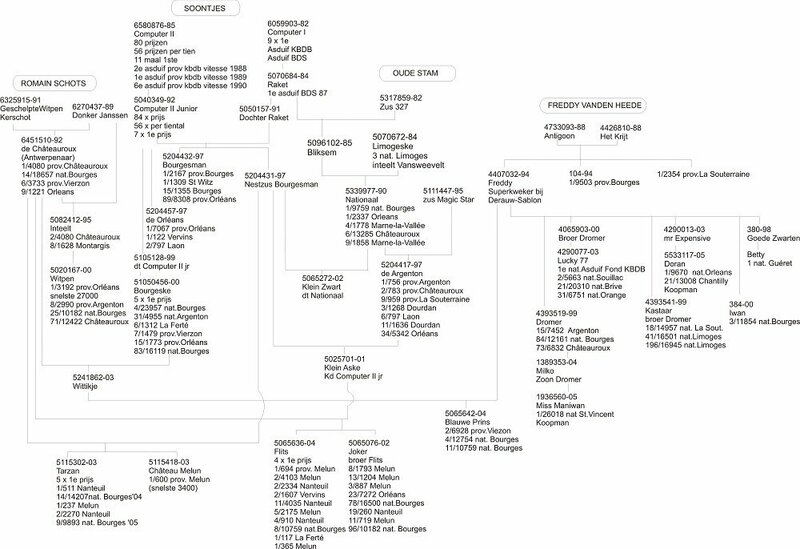 So now we understand why Pros is quietly confident to shatter his competitors in Vlaanderen with the descendants of the ‘Freddy’, combined with his own breed from the ‘327’-Soontjens, with as extra the line ‘Chateauroux’ from Schots. Pros (justly) calls him De Rauw-Sablon, but in fact the ‘Freddy’ is a direct from Freddy Vandenheede from Zingem, Belgium. To be precise, out of his famous stock couple ‘Antigoon’ x ‘Het Krijt’. Two brothers of the ‘Freddy’ won for Vandenheede a 1st provincial; 1/9,503 from Bourges (also 9th National with the ‘Kanselier’) and 1/2,354 from La Souterraine with 10 minutes in the lead by the ‘FloeFloe’. Other descendants of this top couple have won: 1st National La Souterraine, 1st National Narbonne, 1st National Ace middle-distance … Which shows where the ‘Freddy’ gets his talents from. 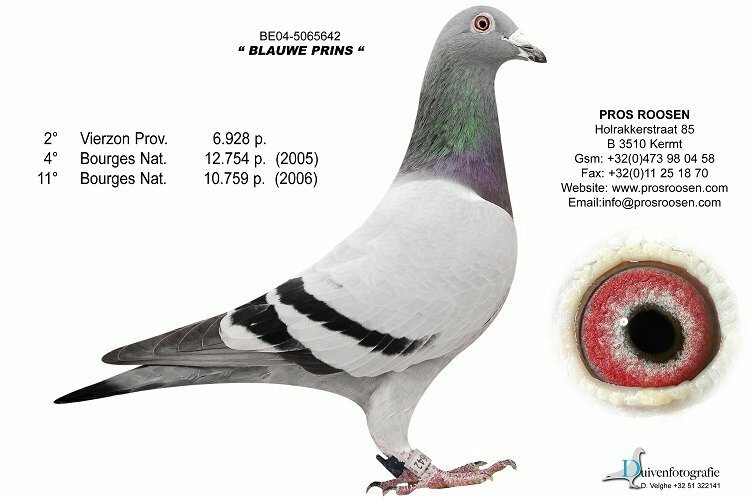 We already mentioned the new breeding formula Pros has adopted: first the best hens of the old breed against the Chateauroux Schots pigeons, and afterwards the offspring of these against the ‘Freddy’ and his children. All of this in varying combinations of course. Can that go wrong ? I doubt it. The recent success with the ‘Blauwe Prins’, the ‘Tarzan’, the ‘Flits’ and others, shows great potential. Therefore we may expect even more stunts from Pros Roosen on the long middle-distance. Because that is still his most cherished discipline, with the race from Bourges as his absolute favorite. The prize list of Pros from this Queens’ Race is not insignificant, especially when you realize that almost all of these prizes are won with his first or second nominated entries. Without wanting to contradict himself, Pros admits that he still has ambitions for the long-distance. Barcelona shall never become his first objective. And if he should have to choose, the races from 500 to 700 km will always come first. But to stand on the rostrum in the Barcelona Club in Brugge (four times already) also has its charm. Therefore he can’t resist breeding for the long-distance with the best blood lines. He specifically uses pigeons from Wijnands and son, and from Cor de Heijde, and of course from some others too. But he always wants to keep it limited. “I race the long-distance my own way,” says Pros with a smile, “with a few pigeons I gamble on Barcelona.” Because the man from Kermt can’t resist gambling. But it is always calculated gambling. Pros will not enter the race from Barcelona with second grade pigeons, and he showed that by buying several champions at the sale of Wijnands and son. He bought lot 1, the ‘Gimondi’ (1222077-96), 14th National Barcelona. Also lot 100, the ‘Cipollini’. And lot 14 and 163, two daughters out of the ‘Olano’ (NL 2015266-94), a grandson of the ‘Blauwe Vanoppen’ with 1/4,449 National Marseille in 1997; and also 9/3,689 Provincial Bourges. That the ‘Gimondi’ was 12 years old, didn’t worry Pros. That was also a calculated gamble, he thinks (like he did with the ‘Antwerpenaar’ from Schots, and with the ‘Freddy’ from De Rauw-Sablon …). The ‘Cipollini’, also a son of the ‘Blauwe Vanoppen’, is some three years younger than the ‘Gimondi’, so he should be good for a few breeding years yet. In 1998, out of the mother of the ‘Primus Inter Pares’, Pros bred a hen, that would be as good as her renowned half-brother. Her father came from Wyffels Gerard. Her first races from Barcelona were highly successful, 23/13,161 National Barcelona in 2001 and 157/13,021 National Barcelona in 2002. With these results she won the two-years classification of the BBC. Regrettably, she was lost during an easy race from Perpignan, together with the ‘Zilveren Brive’, another promising pigeon from her loft. 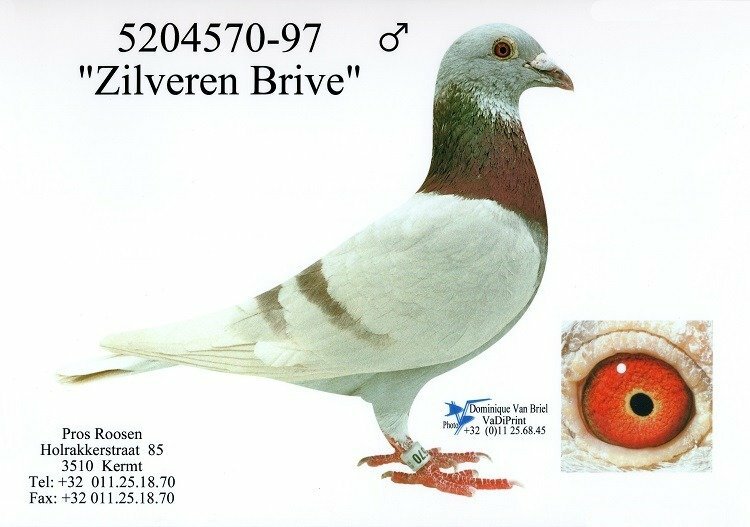 The ‘Zilveren Brive’ (5204570-97), a grandson of the ‘Rooie Interpares’, won among others the 1st from Brive against 980 pigeons, 18/1,225 Provincial Jarnac and 24/1,248 National Souillac. Happiness and sorrow can sometimes follow each other quickly. What should have been one of Pros’ greatest achievements from the long-distance, ended in one of his biggest disappointments. Decide for yourself. – 27 July, Provincial Souillac, 68th and 253rd against 1,261 pigeons. You would expect a national or at least a provincial championship long-distance. But no: they didn’t classify because the lowest prize wasn’t in the top 20% … for that it would of had to be a 252nd place. Is that galling or what? But rules are rules. And Pros, always the optimist, didn’t dwell on it too long. “I only want those absolute toppers, and they all have something special. It doesn’t take five years for me to recognize that … The rest is wishful thinking,” Pros says. Can it be that Pros is right, and that we keep these pigeons, just in the hope that they will amount to something in the end? But the ‘angel on his other shoulder’ corrects him in that and Pros adds: “Now, now, don’t write all that down, you hear. What if it doesn’t work out that way? I don’t want to count my chickens before … you know …” And that too is really Pros, very ambitious and sure of himself, but at the same time realistic and discreet. A man after my own heart. As an encore, Pros gives us his 10 Commandments for the pigeon fancier. Whoever pays attention to these rules , will certainly become a champion. – Believe above all in the good quality of pigeons, but don’t believe everything you hear. – Always couple good with good, the basket will show you how. – Pigeons with dry or hard feathers have to be removed unconditionally. – Only a few pigeons in a loft gives them a good form without effort. – Always feed lightly and when basketing, use a small basket ( Few entries). – Don’t use medication too often, otherwise your pigeons will suffer more ailments. – Always be strict and consistent, a pigeon is easily spoiled. – Always watch your pigeons, you can learn a lot from them. – If they exercise with pleasure, they are certainly healthy. – And when they are in top form, spent a little money on pooling.